In this article, you will learn how to build a website and link to it domain purchased from a third party supplier. Websites built in web design software WebWave are viewed under subdomain webwavecms.com by default, which means your website might get a site address http://SiteID.webwavecms.com. 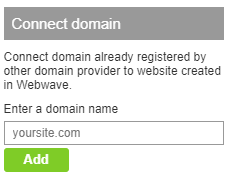 To every website built in WebWave, you can easily link your own domain and your site address will change to http://YourSiteName.com. In order to redirect domain registered at the third-party supplier to your website built in WebWave, you need to make only two steps. The first step is to add your domain to a website created in website builder WebWave CMS, so your website knows its site address. Go to the site address. In a new window select "Link domain", enter domain name and press "Add". A new window pops out, telling you how to redirect domain at a company where you registered it, so it shows your new website. If you enter site address which hasn't been registered yet, on the left side of the window you will be able to do it. If you add your domain e.g. YourDomain.com, there is no need to add www.YourDomain.com too. For WebWave web design software, these two addresses are the same. You can add just one and both of them will work correctly. Don't forget to select one (with 'www' or without 'www') as the main one. It has a huge impact on SEO (read more). If you still don't know how to do it, contact your supplier and ask to redirect your domain in a way it is recommended in the article.